THIS BOOK GOT ME PUMPED. Moxie Girls Fight Back! Vivian is sick of the sexist teachers and students at East Rockport High School. When she finally hits her breaking point, she begins distributing copies of Moxie. 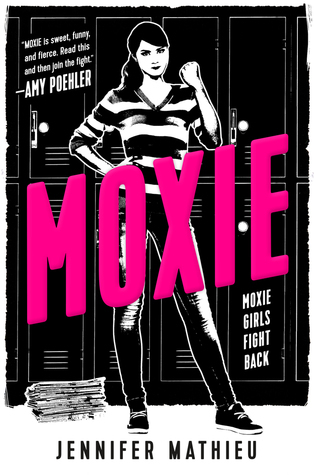 Moxie is a zine she creates to bring together the girls in her school to fight back in simple ways, like drawing stars and hearts on their hands to show solidarity. This movement eventually builds into something that will change not only Vivian, East Rockport High School, but people all over the world. This book is absolutely filled with girl power, feminism, discussions about what is right and wrong, and other deliciously *moxie* things. I love this book so much! Read if you need a massive dose of girl power in your life (even if you’re male!!!). New Release Tuesday! I Stop Somewhere is a very emotional, sad, and gripping book. In the vein of novels like The Lovely Bones, we follow Ellie as she watches her murderer from the afterlife as a ghost of sorts. Where it differs, is that this book alternates between the past leading up to Ellie’s murder, and the present as she watches girl after girl be assaulted just like her, unable to do anything to help. Finally, one of the victims speaks up. It isn’t easy, as the two assailants are the sons of the most powerful man in town, the one buying up all the foreclosed houses and remodeling them to keep the town from shriveling up and dying. Ellie watches as the girls struggle with the repercussions of their attacks, the boys scramble to save themselves from prison, and the police struggle to solve Ellie’s now long-cold case. This book is very graphic, but it is also very addictive. I flew through it, pausing to reflect on how sad the story was, getting pissed at the bad guys, and wishing I didn’t have to do real life things instead of reading. I read an ARC of Scythe by Neal Shusterman last year, and it absolutely blew my mind. It is on my list of top favorites of all time. Check out my gushy ramblings about book 1 here. Obviously if you haven’t read Scythe, you will not understand all the spoilers for book 1 below. Come back after you’ve read Scythe and you’ll thank me! Just as a refresher, when we left off last time, Citra had just been named the newest Scythe in Mid-Merica. Her first task was to glean Rowan, but due to her brilliance, he got away. Enter Thunderhead, the second book in the trilogy. The Thunderhead is the all-knowing being that controls and regulates everything on earth, with one exception—anything dealing with the Scythedom. The main theme through the entirety of the book is whether it’s right or wrong for the Thunderhead to police the Scythedom, especially with the rise of the New Order Scythes. They love to cause pain, fear, and revel in their celebrity and immortality. Citra has continued her fellowship with Scythe Curie, now as her new identity: the Honorable Scythe Anastasia. They continue to glean as they are required, and always ensure they perform the grim duty with dignity and humility. When there’s a shake-up at the Mid-Merican conference, they are both thrown into deep political drama. Rowan, meanwhile, is cavorting around as Scythe Lucifer, all dressed in black like the grim reaper. He has taken on the task of hunting down, gleaning, and burning the bodies of the Scythes who have gone bad. He makes one mistake, and definitely suffers the consequences. The rest of the plot will just absolutely blow your mind. It is literally unreal and haunting. I sat catatonic for quite an embarrassing amount of time when I finished reading. So anyway, this series is incredible and you are missing out so hard if you haven’t picked it up yet. It has amazing characters, enchanting world building, puzzling moral questions, and twist after twist after twist. Buy Scythe (Book 1) here. Okay everybody, take a seat. This is another case of “Why didn’t anyone force me to read these before? !” So here I am to shove these books in your face and make you read them. This is a three-book series: The Unbecoming of Mara Dyer, The Evolution of Mara Dyer, and The Retribution of Mara Dyer. The Unbecoming of Mara Dyer starts off with Mara starting a new school in Florida after surviving a building collapse that kills her three best friends. Mara is understandably distraught and is diagnosed with PTSD that leaves her hallucinating at random. At her new school, Mara meets Noah Shaw, a supposedly notorious ladies’ man. There’s something about him that she can’t put her finger on, but he eventually convinces her to go on a date with him. But Mara isn’t sure all of her hallucinations are actually figments of her imagination. Some of them are too real. She starts receiving creepy messages and photographs, and she suspects they’re coming from her deceased ex-boyfriend, Jude. I can’t really get into any more details because it’ll be too spoiler-y. This series is awesome because it combines so many genres flawlessly. It has YA contemporary, paranormal, fantasy, historical fiction, and more. It’s amazing, really. The audiobooks are narrated by Christy Romano… yes, that one — Christy Carlson Romano, known best for her role in Even Stevens and the voice of Kim Possible. Because *excited face* there’s a new spinoff series coming out that focuses on Noah! The first one is called The Becoming of Noah Shaw and it comes out November 7th, 2017. So get caught up now, because there’s about to be another installment in the series! Overall, I give this series 4.5 stars. Buy the box set of the first three books here. Pre-order The Becoming of Noah Shaw here. But there’s one problem. St. Clair has a girlfriend already at a nearby college (and her name is Ellie, which made this book really hard for me to read!). But then St. Clair begins to take an interest in Anna, finding out they both like movies and they both enjoy each other’s company. They become very close — like best friends close. As much as Anna likes St. Clair, she has to remember Ellie. And St. Clair seems to have a hard time remembering her as well. Thus, here’s the book’s big question: Will St. Clair stay with Ellie, or will he follow his new crush with Anna? This book had me feeling very conflicted. I found it absolutely adorable and fun and unputdownable, but I also had a lot of issues with Anna’s spoiled attitude and St. Clair’s unfaithfulness (while not physical, it was still emotional cheating). If you can look past these things, it was really enjoyable — don’t get me wrong. It’s just really exhilarating to cheer for Anna to finally get her French Kiss. In a futuristic world, humans have found the cure for every disease and can keep people alive indefinitely. Since this would lead to overpopulation, the world has Scythes who randomly choose citizens and kill them. It’s a government-provided service and is considered something that is good for the community. Citra and Rowan both have run-ins with Scythe Faraday, who is in turn impressed with the two teenagers’ personalities. Faraday decides to take both on as apprentices for one Scythe position. They learn more about the society that Scythes are ruled by, and train in combat, compassion, and common sense. There are several tests that they are required to perform, and the best apprentice will become a full-fledged Scythe, granting them and their family immunity from death. While this sounds very morbid, this book was absolutely fascinating. I read this monster in one day, putting off everything I should have been doing instead. Scythe is so well-written and has such an amazing premise and world-building. This is the first book I’ve read by Neal Shusterman, and I definitely plan on reading his other books now. It’s easy to get lost in the story, rooting for the good guys, hoping the bad guys get what’s coming to them. Definitely pick this one up — it’s to die for.